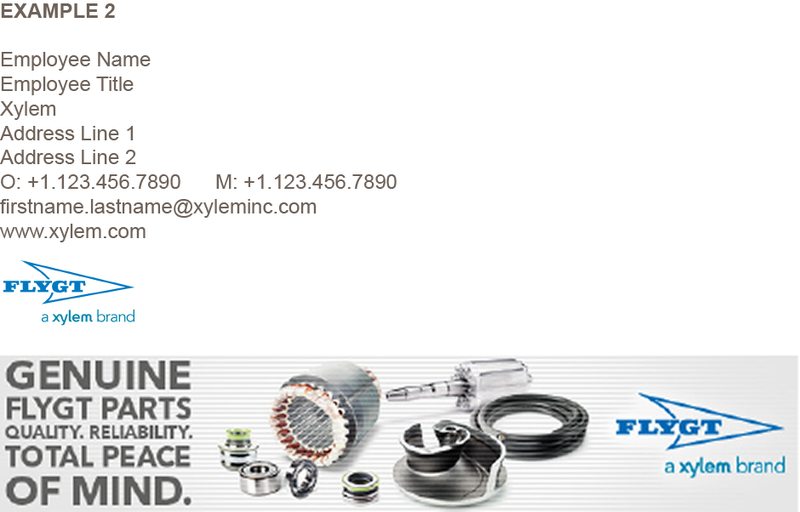 Email Signatures | Xylem Inc.
Email is the most common form of business communication today. It is critical to communicate contact information clearly and consistently across our organization. Therefore, we have developed standard formats for email signatures that all employees should follow in keeping with our brand guidelines and a consistent external image for our corporate and product brands. There are two basic formats, full and abbreviated. 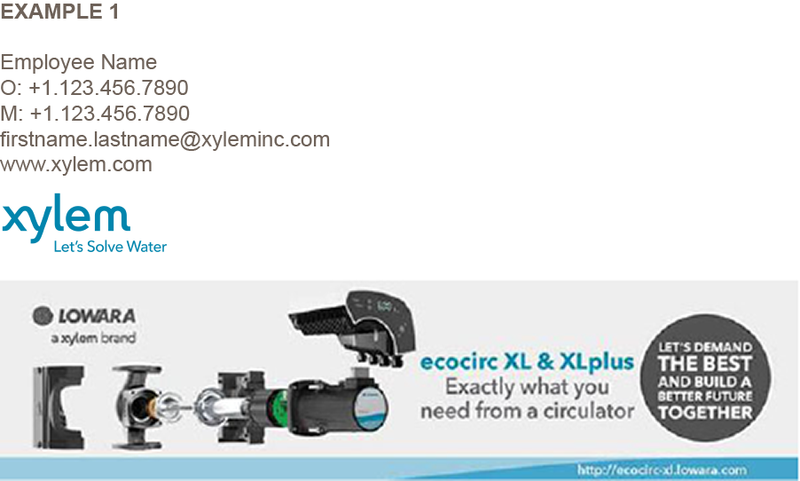 Either format may be used with either the Xylem logo and tagline or a single product lockup. The text of the email signature should appear in Xylem gray in 10- or 12-point type. Specially sized logos have been formatted specifically for use in email signatures and are available for download on this site. To ensure consistency, it is recommended that you use one of these logos when creating your signature. Please do not alter the size or color of the downloaded logo. Detailed step-by-step instructions on how to set up your personalized email signature in Microsoft Outlook follow the samples below. If you do not use Outlook as your email application or need assistance in setting up a signature, please contact your local IT department to have them configure a signature for you that replicates one of the formats below. Email signatures should not have more than one logo image. If multiple product brands are represented, use the Xylem logo with tagline and list the product brands in text below the logo. The brands are in Xylem Gray and are separated by vertical lines. There are two spaces before and after each vertical line, as shown in the examples below. Although an unadorned signature is preferred, in some instances you may wish to add a banner promoting a product announcement or tradeshow event to your signature. Please adhere to the following guidelines and refer to the samples provided when adding promotional banners. Do not add multiple banners to a signature. The banner must appear after your signature. Do not place it anywhere before or within your signature. The design of the banner should align closely with our current advertising (samples can be found in our Online Advertising guidelines) or with the established look of the promoted product announcement or trade show. Save banners at 96dpi. Keep the total area under 100,000 pixels squared, and do not exceed 600 pixels wide. Some recommended sizes are: 600 x 150, 450 x 150, 250 x 350 and 250 x 250. Save the image in JPG or GIF format, and do not use animation. Keep the file size under 45kB to ensure quick loading and conserve internal server space. In the main Outlook window, on the Tools menu, click Options and then click the Mail Format tab. Under Message Format, in the Compose in this Message Format dropdown, make sure HTML is selected. Under Signatures, click the Signatures… button. In the Signatures and Stationery dialog, on the E-mail Signature tab, under Select Signature to Edit, click the New button. In the New Signature dialog, type a name for the new signature (i.e., Xylem – Abbreviated, or Xylem – Full), then click OK.
Back in the Signatures and Stationery dialog, under Choose Default Signature, select the name of the signature you just created within the New Messages and Replies/Forwards dropdowns. From the font dropdown, choose Arial. From the point size dropdown, choose 10 or 12. From the font color dropdown [Automatic], choose More Colors. In the Colors dialog, on the Custom tab, make sure the Color Model dropdown is set to RGB and set the value for Red to 83, Green to 86 and Blue to 90. Back in the Signatures and Stationary dialog, in the Edit Signature box, click into the main text input field and, depending on the type of signature you have chosen to use (Abbreviated or Full), enter your personal information like it is formatted in the examples. Note: Regarding phone number formatting – “O:” represents “office”, “M:” represents “mobile” and there should be 6 spaces between phone numbers in the Full signature. To insert the logo, place your cursor at the beginning of the line just below your email address. Click the Insert picture icon. Navigate to the logo you downloaded and click to select the image. Click Insert. Scale the image to 50%. In the Signatures and Stationery dialog, click OK. In the Options dialog, click OK.
Steps might be slightly different depending on the version of Outlook installed on your computer.